Heterochromia iridis is a rare (and often strikingly gorgeous) condition in which animals, including humans, have two different colored eyes. It’s particularly noticeable in dogs and cats. So why does it occur? The iris of the eye is colored by melanin (the same stuff that gives pigmentation to our skin.) Heterochromia occurs as a result of excess or lack of melanin in one eye. It may be congenital, or develop over time. Genetics are a potential reason for occurrence, as well as injury. Myths and legends abound concerning these dogs. 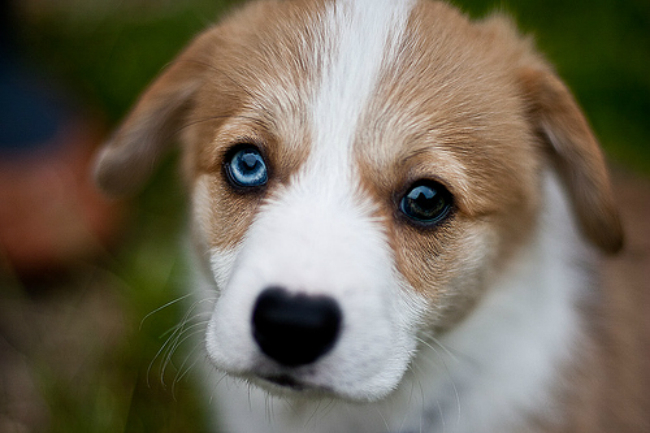 Some people believe that heterochromatic dogs can see both heaven and earth at the same time. Others think that these dogs suffer from blindness, when in fact the condition usually has no adverse effects on vision. Certain breeds, like Huskies, Australian Shepherds, and Louisiana Catahoula Leopard Dogs are more likely to have this uncommon trait. Many celebrities are known for their heterochromia, like the legendary David Bowie or actress and dog-lover Kate Bosworth. No word as to whether or not her beloved pup has the condition. Whatever the reason for a pup’s mismatched eyes, it’s our little differences that make us special!